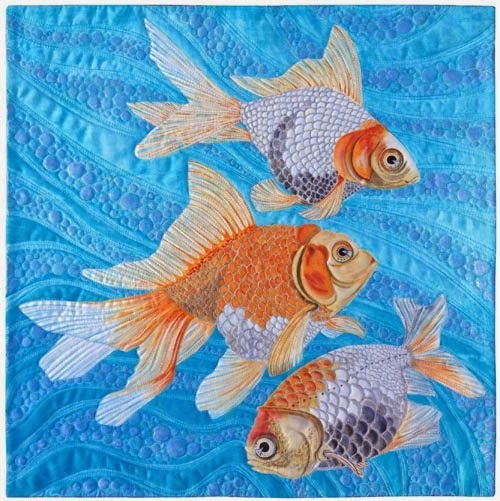 It is based on my sketches of goldfish, and wholecloth painted. 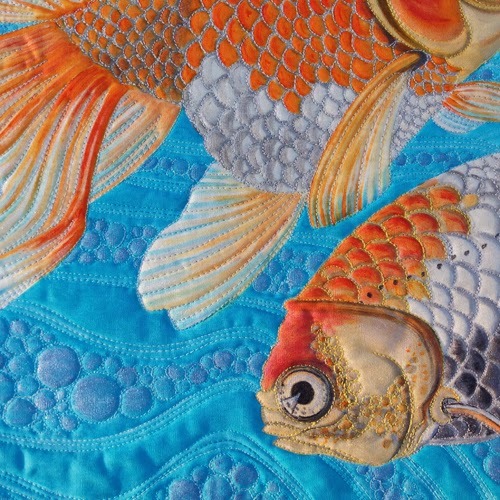 After quilting around all the scales, and the details on the goldfish, I quilted lots of water currents and bubbles in the background. But I wasn’t entirely pleased with it, so I rubbed some purple-blue shimmery paint on the bubbles, which made them stand out a lot more. It was very tricky getting good photos of this piece. I had to shoot it five times – at different times of day today – to get the photos in this post. Some of the shots were too washed out, some were too flat. The photos here are pretty true to color, and I’m pleased with how the texture of the quilting shows. To see photos of this piece in progress, visit my blog here.